Who created the U.S. flag? Was it Betsy Ross? Maybe! The evidence is compelling, though not conclusive. Several of her relatives testified to having heard extensive details of the flag's creation. The testimony is entirely plausible, and no other claimant has ever produced any equally compelling evidence, but no preserved documents from the Continental Congress or the personal correspondance of George Washington or any related figures has emerged to either confirm or contradict the claims made by Betsy's decendents. Are these people telling the truth? Is it all a carefully orchestrated hoax? Somewhere in between? That's up to you . . .
Why do some people think that Betsy Ross's creation of the flag is a myth? Betsy's creation of the flag is not an established historical fact, like the signing of the Declaration of Independence in Independence Hall in Philadelphia, or Washington's winter at Valley Forge. Those events quite definitely took place, and were public knowledge from the beginning. Most of us learned about all those things in school. Upon learning later that Betsy Ross's flag creation has not been established with the same level of certainty as those other events, some conclude that it was therefore a myth or a hoax, like George Washington and the cherry tree. That's a genuine American myth. Betsy is not. The available evidence is insufficient to establish Betsy as the creator of the flag with certaintly. But it's entirely plausible and consistent with the evidence we do have. Some suggest that sexism explains the reluctance to accept Betsy's achievements, but perhaps it is simply a misunderstanding of the process of history. Historians don't have all the answers. They don't have a complete and reliable record of the past. Historians need to interpret the available evidence to construct as accurate a picture of the past as they can, and sometimes the available evidence is incomplete and inconclusive. That's very different from a hoax or a myth. According to legend, George Washington interpreted the elements of the flag this way: the stars were taken from the sky, the red from the British colors, and the white stripes signified the secession from the home country. However, there is no official designation or meaning for the colors of the flag. Why are the stars in a circle? The stars were in a circle so that no one colony would be viewed above another. It is reported that George Washington said, "Let the 13 stars in a circle stand as a new constellation in the heavens." If Betsy sewed the flag, who designed it? "[The committee] showed her [Betsy Ross] a drawing roughly executed, of the flag as it was proposed to be made by the committee, and that she saw in it some defects in its proportions and the arrangement and shape of the stars. That she said it was square and a flag should be one third longer than its width, that the stars were scattered promiscuously over the field, and she said they should be either in lines or in some adopted form as a circle, or a star, and that the stars were six-pointed in the drawing, and she said they should be five pointed." Why would Betsy Ross be chosen to make the flag? It was usual in that day for upholsterers to be flagmakers. 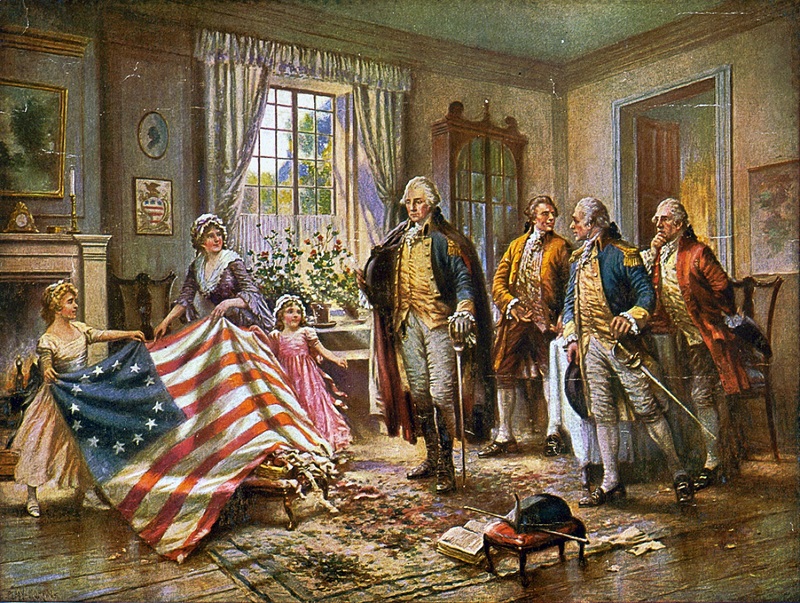 As Betsy Ross prayed in the pew next to George Washington and had already sewn buttons for him, and she was a niece of George Ross, it is not exceptional that these members of the Flag Committee formed by the Continental Congress would call upon Betsy Ross to make the flag. It is known that Betsy Ross rented rooms here. At the time of the alleged flag creation, she was either here at 239 Arch Street or next door at 241 Arch, where the garden is now. House numbers on her street between the years 1785 and 1857 were registered using three different numbering systems, making the determination very tricky. If you are interested in historical detective work, you'll enjoy the methodical, historical approach used by experts: check out the Was this her house? page. Where is the first flag? We have very little definitive information about the first flag. Betsy's association with the flag arose through an oral history brought to public attention long after the flag's creation. No actual flag exists that is alleged to have been the first flag created by Betsy Ross. Why is the flag called "Old Glory"? Mary Young Pickersgill sewed the very large (30'x42') Star-Spangled Banner in the summer of 1813. It flew over Fort McHenry during the War of 1812 (1812-1814) and was the inspiration for Francis Scott Key to write what would become our National Anthem. Pickersgill's flag today hangs at the Smithsonian Institution in Washington, DC. Her house still stands as a museum you can visit in Baltimore, Maryland. A vexillologist is an expert on flags and ensigns. A vexillum (plural vexilla) is a military standard or flag used by ancient Roman troops. 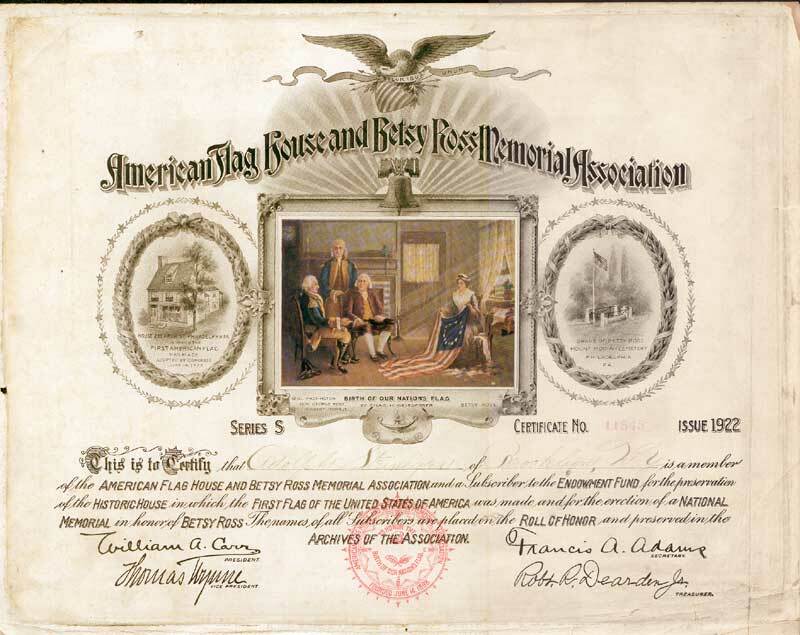 Many people discover among their family relics a certificate from the American Flag House and Betsy Ross Memorial Association. What is it? Over two million of these certificates were sold starting in 1898 in order to raise funds needed to preserve the Betsy Ross House. These certificates were receipts or "thank-yous" for contributions of 10 cents. The Association went out of business in 1935. The only "value" to these is the knowledge that the recipient participated in the preservation of the Betsy Ross House.